My two friends and I were about to go to bed when I thought I should throw out the garbage. I went to the back door and hoofed it out—wow! I looked up at the sky and it was totally starlight…no moon out that night, but it was a clear as a crystal out there. It was so beautiful that even the snappy cold night didn’t faze us: we decided to go out for a walk. We underestimated the cold, though, and found out the hard way. We had walked halfway down the straight rail-bed (now our road, which is about 2 km from my house) beside our old iron mine when we realized just how cold we were. It was a good thing we were walking, or our feet would have frozen as well. Our legs were numb, we had only brought light jackets and hats, running shoes, and no mittens or ski-pants. 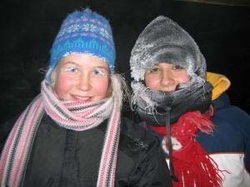 Our faces were frosted white as well as our hair and hats. And we were only half way done! Burrrrr! But it was worth it. The stars were shining so brightly, and the Big Dipper looked gigantic. In twenty minutes we had managed to arrive back home. After warming up on the heated cement floor we decided to go out again—this time we would head up the bush trail towards Magnetic Lake. We bundled up good for this one, knowing how cold it was going to be. We had hats, mitts, scarves, jackets, lined boots, neck-warmers and ski pants. We again admired the breathtaking scenery of the stars and walked mostly with our heads back so we could gaze at the starry sky. We were now on a hard pack snow machine track, but it was hard to fit 3 people walking beside each other on, so whoever was on the outside kept on falling in the unpacked snow. One moment we were walking and talking as usual and then I seen the forest light up like daylight, but just for a second or so. I hadn’t seen what it was but Tara said she saw a silvery burning ball flying through the air. It must’ve been a meteorite. It was so beautiful and we are so lucky to have seen it. Although we never got a picture, I doubt that I will ever forget it. When we got back home we noticed that we all had white eyelashes and frosty hair. We managed to get some photos of them.